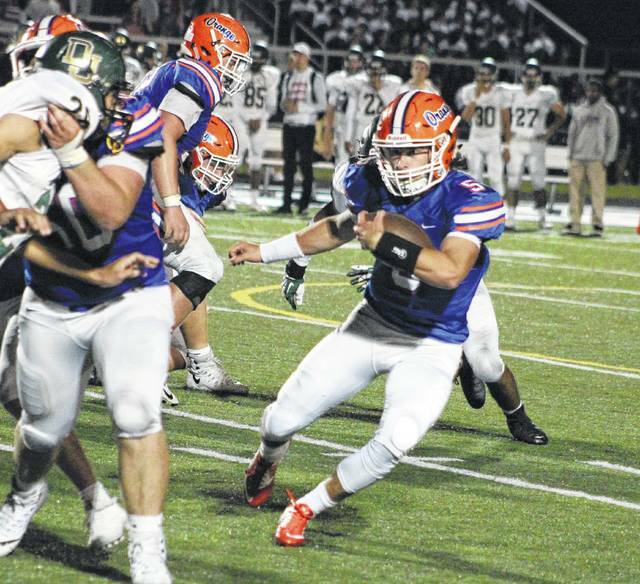 The Olentangy Orange football team ended both halves well, outscoring visiting Dublin Jerome 21-0 in the second quarter and 10-0 in the fourth to seal a convincing 31-7 non-league win Friday in Lewis Center. After a scoreless first quarter, Jack Applegate broke the scoring seal with a two-yard touchdown run with 9:36 left in the second. Orange (3-0) quarterback Luke Schmeling hit Manny Anderson for a 15-yard touchdown pass three minutes later and found Jayden Rodgers for a 17-yard TD to balloon the lead to 21-0 with 2:47 left in the half. Jerome got on the board when Hayden Schell and Trey Ballengee hooked up for an 82-yard touchdown on the first play of the second half, but the Pioneers’ Grant Simon booted a 41-yard field goal early in the fourth before Applegate scored his second touchdown of the game, this time from 20 yards out, to smooth out the scoring summary with 5:53 to play. Schmeling completed 10 of his 15 passes for 188 yards and two touchdowns. Graham Starn, meanwhile, paced the Pioneers on the ground with 82 yards on 15 attempts while Anderson had 104 yards receiving to go with his touchdown. The Cougars returned a fumble for a touchdown early in the second quarter and didn’t trail the rest of the way, handing the host Pacers their second straight setback Friday night in Delaware. Hayes (1-2) got back to even when Isaiah Moore punched it in from the one-yard line with 5:06 left before halftime — a score set up by a Westland fumble — but trailed 10-7 at the break. The Cougars made it 12-7 with a safety midway through the third quarter and scored what proved to be the game-winning touchdown early in the fourth. The Pacers’ Blake Eiland hit Blain McCormick for a 20-yard TD pass with 6:50 to play — another touchdown set up by a fumble — but a turnover on downs late in the game ended Hayes’ comeback bid. Ian Drummond hauled in a 15-yard touchdown pass from Riley Bruening, giving the Braves a 7-3 lead late in the first quarter, but the host Raiders rolled the rest of the way en route to a non-league win Friday in Reynoldsburg. Olentangy (2-1) maintained its edge until the end of the first quarter, but Reynoldsburg took the lead for good when Mershawn Rice snagged a 34-yard scoring strike from Justin Henry on the first play of the second quarter. The Patriots trailed heading into the fourth quarter, but outscored the host Monarchs 13-0 in the final frame to notch a non-league win Friday in Marysville. Down 21-19 with just over eight minutes to play, Liberty quarterback Mitchell Okuley found Johnny Wiseman from nine yards out to give his team a 25-21 lead. The Patriots missed on the ensuing two-point conversion, but it turned out they didn’t need it. Matt Webb powered into the end zone from two yards out with 4:54 to go to account for the final margin. Okuley completed 12 of his 20 passes for 151 yards and three touchdowns, two to Ben Roderick in the first half. Roderick had four grabs for 50 yards and the two scores while Webb had his best game of the year with 30 carries for 132 yards and two TDs. Olentangy Orange’s Luke Schmeling (5) looks for a crease during the second half of Friday’s non-league showdown against visiting Dublin Jerome. https://www.delgazette.com/wp-content/uploads/sites/40/2017/09/web1_qbrun.jpgOlentangy Orange’s Luke Schmeling (5) looks for a crease during the second half of Friday’s non-league showdown against visiting Dublin Jerome.